Before I left London everyone warned me about the cost of a lime in Australia. What was everyone talking about? After the third person had mentioned it I found the story on the BBC website about the outrageous cost of the £1.50 lime (usually about 30p in London). 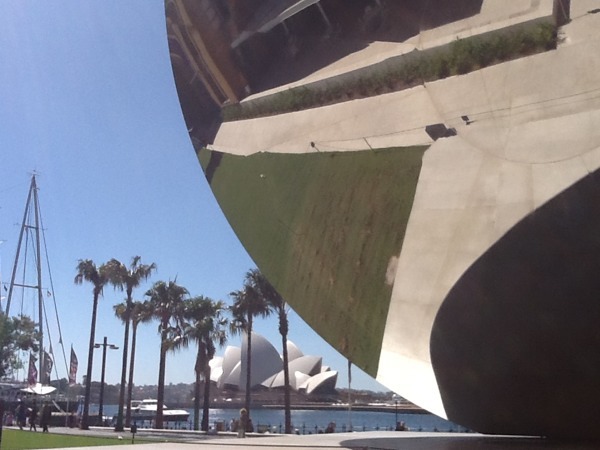 Luckily for me the taste of lime is THE taste of Australia – I have never tasted lime in wines from anywhere else – it is in the Riesling but also in some other varieties I did not expect… Lime is a very cooling taste, so it works well for early evening drinks on hot days. 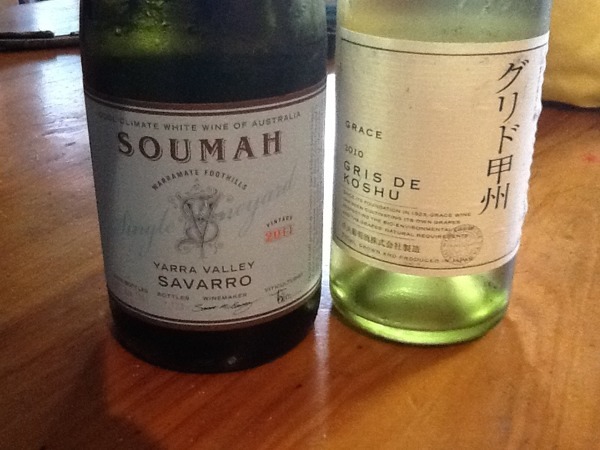 When I visit Australia I like to try wines from regions that I do not see often in the UK. I often despair at the selection in the UK; as relevant to me as Paul Hogan or a Walkabout pub. It’s a formula that works but like any formula it is a bit dull. What is going on in Geelong or King Valley or Tasmania? That is what I was eager to find out. Compared to three years ago, there is more confidence in showing different varieties on the shelves (independent shops). Saying that, Riesling and Chardonnay are taking advantage of their pole position and surging ahead with confidence and great style. What is apparent is that the 2011 vintage has been tough for wine. Across the board, the fruit is less defined and the wines show less depth. The 2012 vintage is back with vengeance: the fruit is powerful and present. The hype about the Riesling is to be believed. Saying that, as Huon Hooke wrote in his recent article in the Sydney Morning Herald, it is worth remembering that the very top Riesling are relatively reticent at a young age. One last note: I find the white wines taste better to me the next day. The fruit is so vibrant and intense from being under screw cap that it nearly knocks me sideways. The fruit dominates the palate. Some will absolutely love this – for me, I like when I can taste other things, too. Not so much a complaint but a personal observation. Also, when the wines are chilled to the inch of their life (it has been 30 degrees most days), it changes the aromatics, so I tasted these wines a few times in the name of research, *ahem*. **Pizzini Arneis 2012, King Valley Victoria** It is Piedmont in bikini! Lean, at ease and comfortable in its expression. A lithe white wine with fine notes of pears, almonds and green apples. An apero-to-dinner table wine. I preferred it to their Pinot Grigio but that is a personal preference for wines without so much upfront fruit (influenced by my recent affair with En Rama Sherry). **Henschke Peggy’s Hill Riesling 2011, Eden Valley** Like an icicle made of lemon and lime in the sun, clean and refreshing. The Peggy’s Hill did not have the depth of a great vintage but this makes it more than adequate for lunch with friends. **Henschke Little Hampton Pinot Gris 2010, Adelaide Hills** – After the Riesling, it was softer and easier on the palate. Very strong aromatics, rich with fruit sweetness. Usually Pinot Gris is the wine I choose when I am with a group of girlfriends who don’t work in wine. It is more interesting to them than Sauvignon Blanc but it is also a lissom thing that easily bends to everyone’s taste and food. The last Pinot Gris I had was Josmeyer Pinot Gris, which was thinner with a snap of acid on finish – this is more generous and friendly with fruit. Particularly good when the weather is hitting 30 degrees heat. **Adam’s Rib Red by Castagna 2010, Beechworth, Victoria** – A Nebbiolo Shiraz blend, intriguing and, annoyingly so, perhaps, when struggling to sleep with jet lag. It kept me awake; I wanted to understand it more as a Nebbiolo obsessive. The alcohol is not high but it was hot on the finish. Although it was a very hot day, so perhaps it could have spent a few minutes in the fridge (not so necessary in the UK). The Nebbiolo was a bit murky when blended with Shiraz – it had lost its bone structure. This wine is a bit young and hasn’t come together yet, and this makes it remarkable for the price. I will definitely be keeping a eye on future vintages. Nebbiolo is not an easy grape, in Piedmont or here; if this was a diver it would get top marks for difficulty. 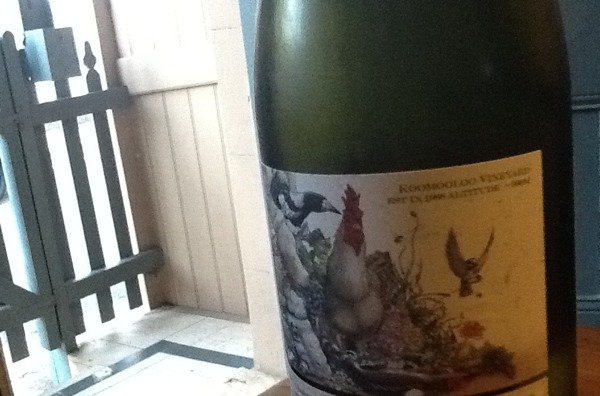 **Bannockburn Riesling 2011, Geelong Victoria** – I have followed Bannockburn with interest for a couple of years. This straight forward and direct with friendly tropical fruit flavours. It was interesting but it didn’t become anything more in the glass. I am perhaps being harsh but as we are talking about Riesling I wanted to taste something of where it was from. It was fun and consistently good, and there’s nothing wrong with that. Yet I long to see more from this vineyard and region. Perhaps it is simply the curse of the 2011 vintage. **Philip Shaw No 11 Chardonnay Orange, NSW** – Admittedly, I haven’t bought or ordered an Australian Chardonnay for a long while, but when I saw this from the ex-winemaker from Rosemount I was intrigued to find out what Philip Shaw was now doing. At 900m elevation, it is a relatively unexplored area of Australia and I am told it was a decision that was decided after much deliberation. Well, the decision proved to be right. This is an elegant Chardonnay and yet distinctly Australian with big generous fruit flavours but integrated in a very sophisticated way that the fruit doesn’t dominate the conversation. Some lovers of big Chardonnay may find themselves straining to hear the flavours, this only makes me lean in and more attractive to me. 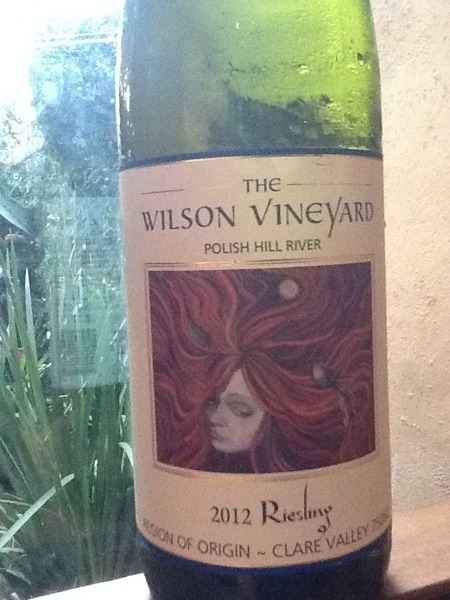 **Wilson’s Vineyard, Polish Hill Vineyard, Clare Valley 2012** – So this is why people are talking about 2012 Australian Riesling. This is intense and powerful fruit showing that lime character to the power of 10. The acidity is good but hidden by the fruit. This is a true expression of Polish Hill, I could pick this blindfolded. Great stuff, but not for the faint- hearted. Savarro By Soumah, Yarra Valley – This is Savagnin grape under an alias travelling from Jura via Asia – Kaffir lime, papaya, tangerine. It is intellectually interesting but I did not enjoy it with abandon – perhaps it would do well with Thai food rather than as an aperitif. Unlike its distant Jura cousin, it is lighter bodied but it is pointless to compare the wines too much as they are so different. It could also be the 2011 vintage striking again. Would like to try another vintage and have my assumptions proved wrong – I find the idea of these varieties grown in the Yarra Valley fascinating. Certainly not a wine to be found in the UK so it was definitely worth a glass or two. 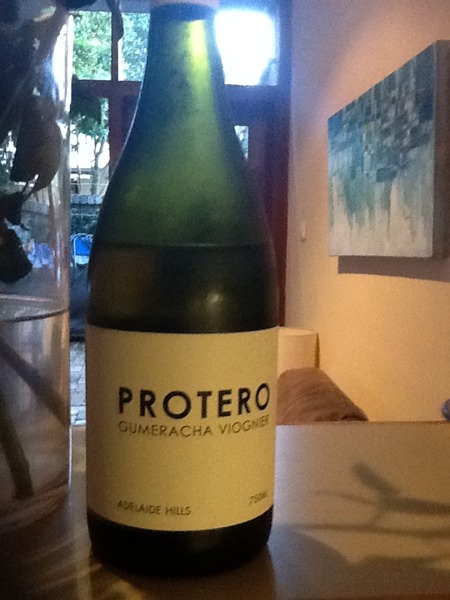 I’m quite, um, particular about Viognier but I love the Protero too! The Adelaide Hills is home to so many small wineries doing interesting stuff and often using less common varieties.